ellipsoid of revolution; an object that is somewhat round but not perfectly round. The Project arises as a respond of re-generate the site in a natural way. 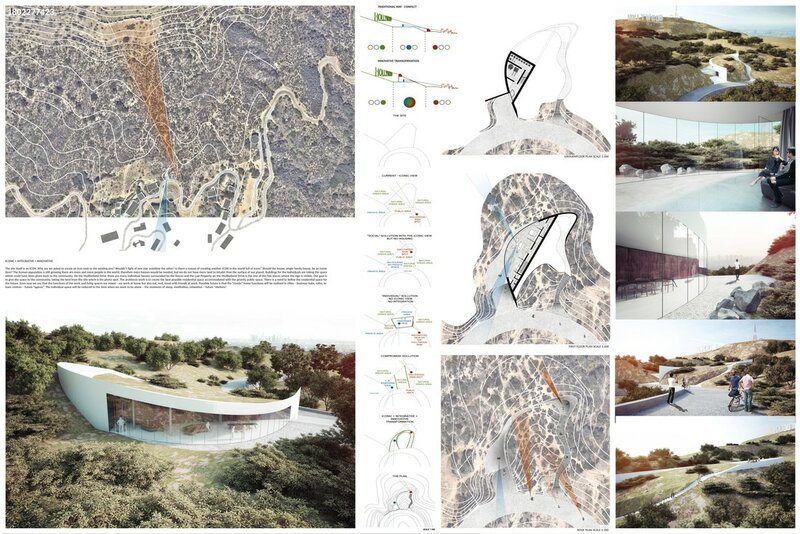 Mimicking the surrounding orography with a geometrical slab which reduce the visual impact and ecological foot print, containing multiple green roofs, which act as a natural cooling system and water collectors to be re used. 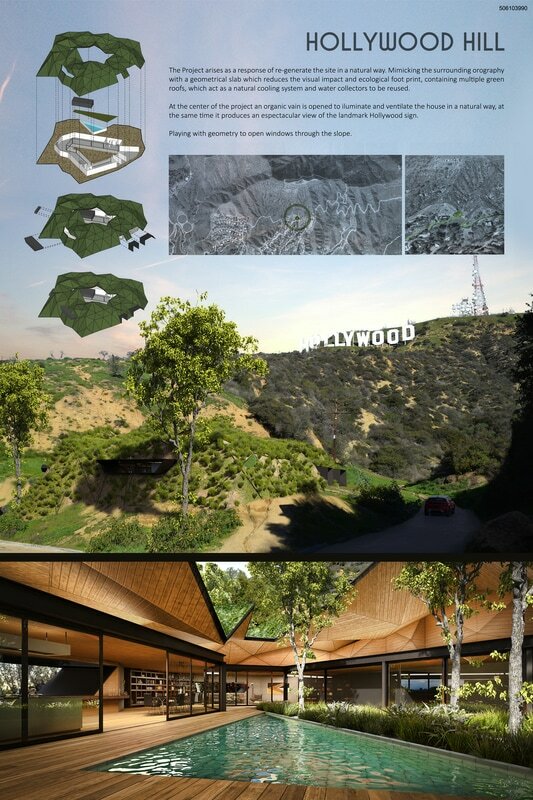 At the center of the project an organic vain is opened to illuminate and ventilate the house in a nature way, at the same time it produce an spectacular view of the landmark Hollywood sign. Playing with geometry to open windows through the slope. The site is strongly characterized by the wild pattern of the surrounding nature. From here the view is open to the wide landscape, from the hills to the LA urban sprawl. The sheet music is complex, made up of overlapping signs, located on a fraught ground, characterized by icons of the global collective imaginary. 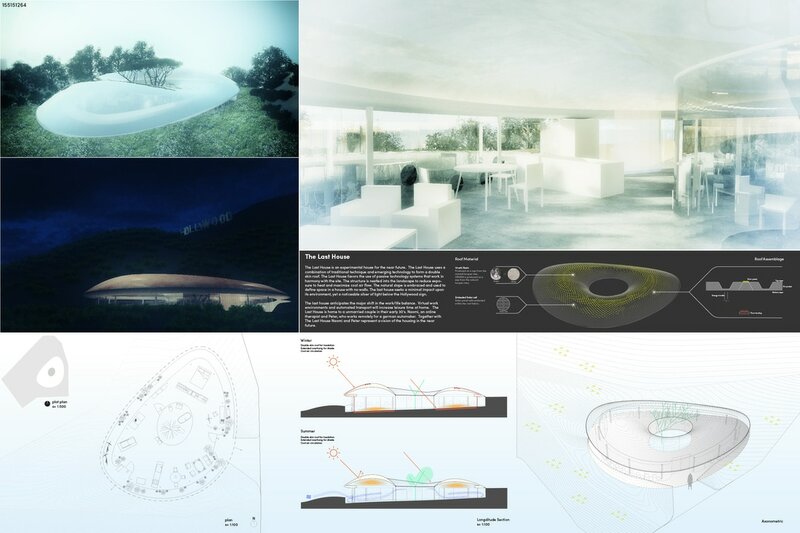 The project is based on simplification, on reduction, on pure forms, on the enhancement of well-being and sustainability. 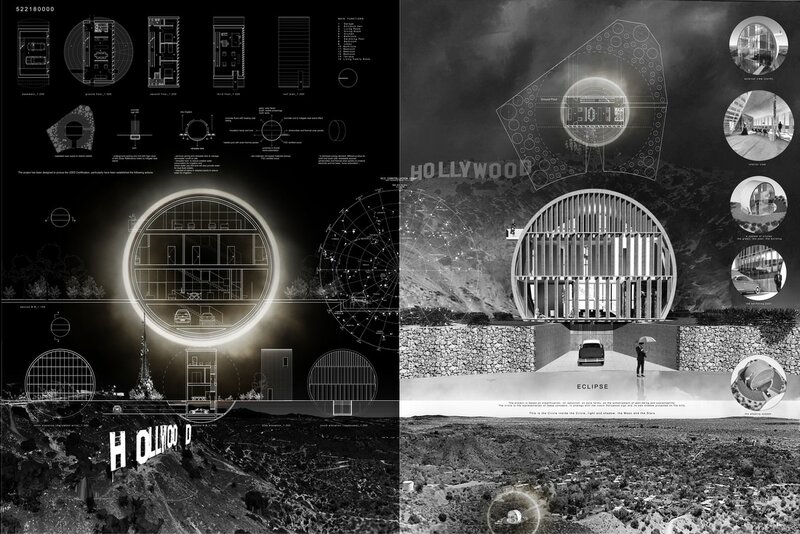 The circle is the representation of these concepts, in analogy with the iconic Hollywood sign and its own shadow projected on the hills. 1. The Home is an actor maintaining agency of various scales. 2. The Home is a cultivation of its politics and environment, but transcends both. 3. The Home endures through the framing of the timely (hi-tech) by that of the timeless (lo-tech). 4. 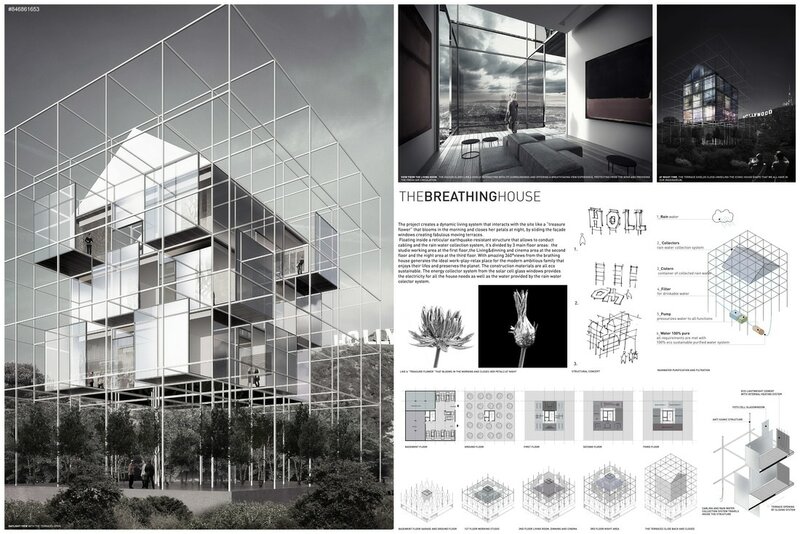 The Home is a vessel composed of numerous stages in intertwined play. 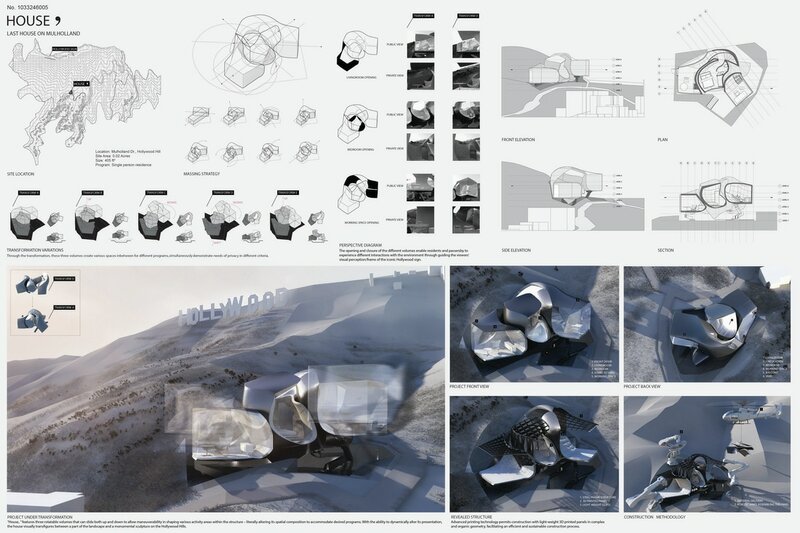 “House,” features three rotatable volumes that can slide both up and down to allow maneuverability in shaping various activity areas within the structure – literally altering its spatial composition to accommodate desired programs. 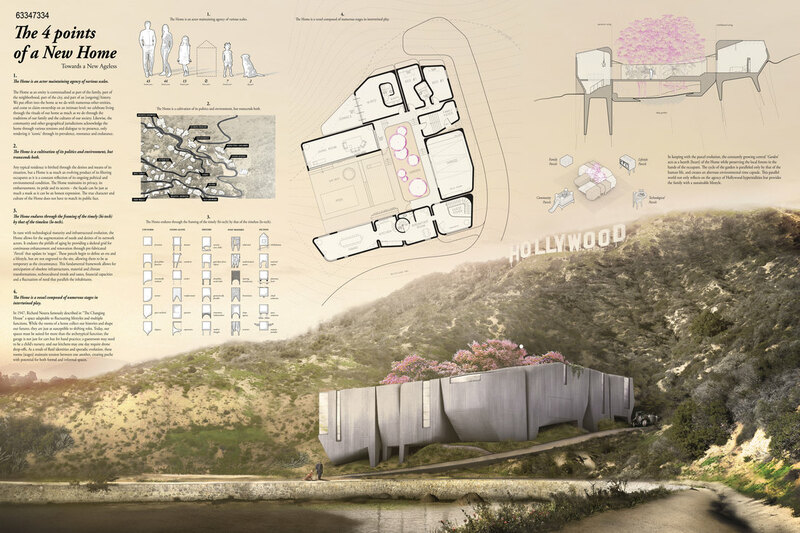 With the ability to dynamically alter its presentation, the house visually transfigures between a part of the landscape and a monumental sculpture on the Hollywood Hills. 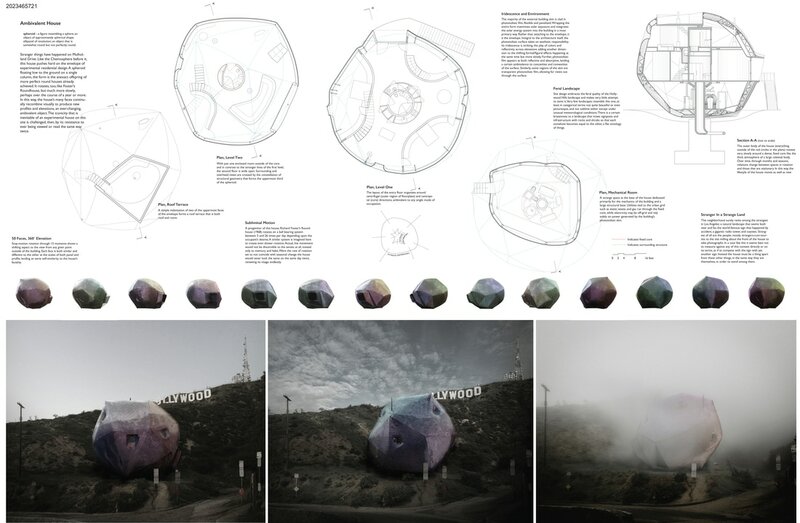 The opening and closure of the different volumes enable residents and passersby to experience different interactions with the environment through guiding the viewers’ visual perception/frame of the iconic Hollywood sign. Advanced printing technology permits construction with light-weight 3D printed panels in complex and organic geometry, facilitating an efficient and sustainable construction process. Every house has a story, this is the story of the LAND house. 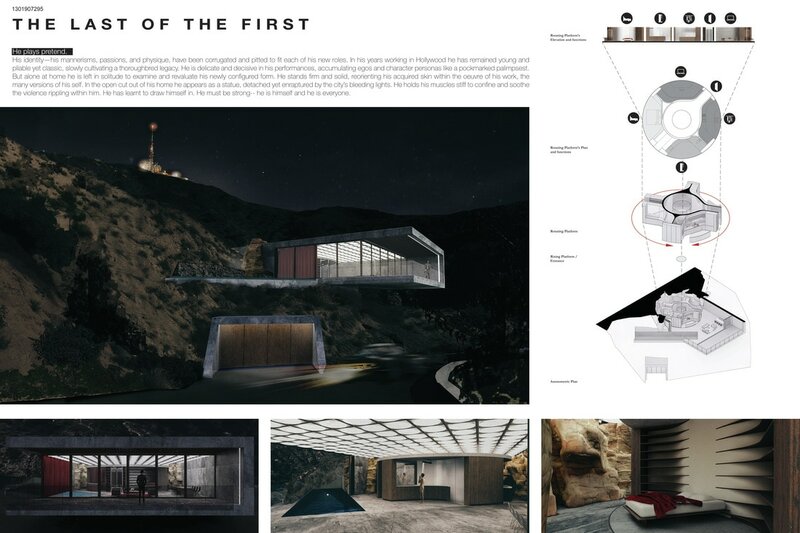 Grounded in the history and culture of the site, this is not the last house on Mulholland, but perhaps the first. I can remember when the sign read HOLLYWOODLAND, announcing the arrival of the neighborhood, and the exile of the last four letters. I took it upon myself to resurrect these letters, and allow them to accomplish their fundamental purpose. The letters once again glow among the flashing of signal towers and warmth of homes. I find solace, retreating into LAND, and excitement in wandering its eminence. The Motion House’s design is perceived as a silver screen of the ground that takes its cue from the Hollywood’s motion picture. The design emphasizes the idea of movement, speed, timing, surprises and shock through appropriate adaptation of technology. 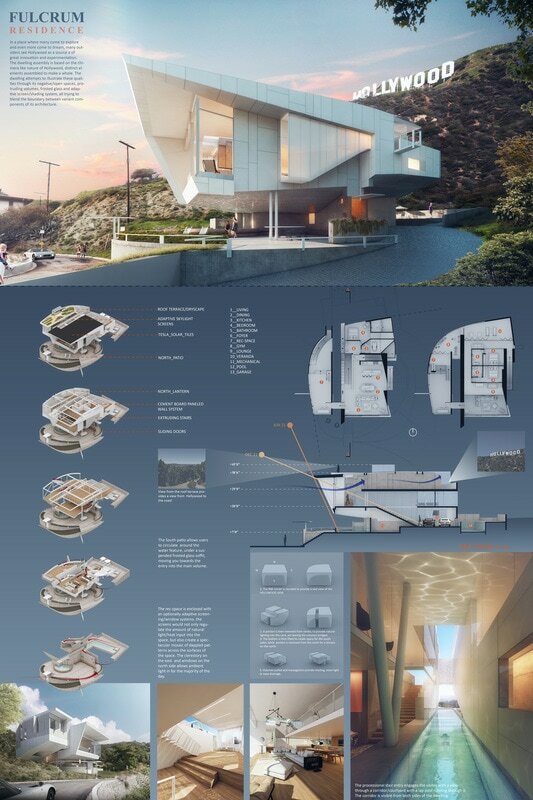 Mechanically controlled by 4 hydraulic lifts, the inner core of the house in glass and steel will rise above ground and fall to sleeping mood according to the house owner’s preference on privacy, view, climate, security and safety. 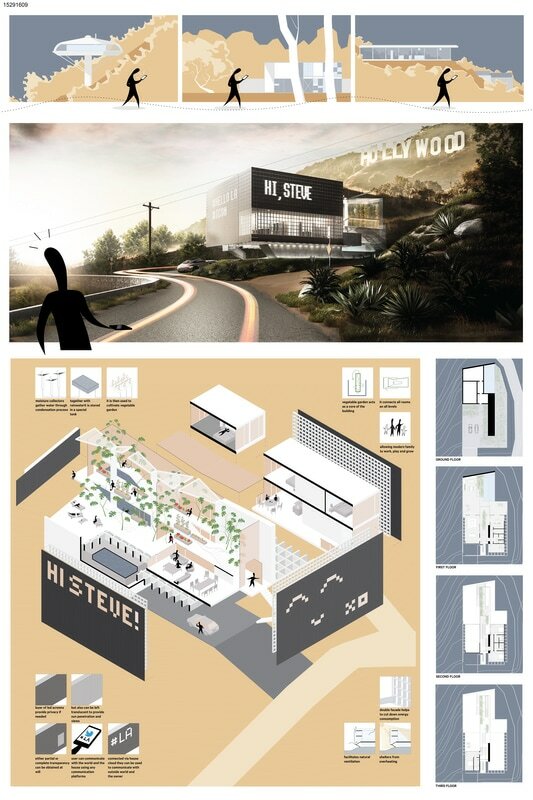 With its ‘hide and seek” nature, the periscope like house will serve as a living organism and fun loving entertainer that aims to challenge the conventional notion of the house design and complement the iconic Hollywood sign, its film industry and neighborhood. Nowadays the functions of the work and living spaces are mixed – working at home but also “living” at work. Possible future is that the home functions will be realized in the public areas. The individual space will be reduced to the time when we want to be alone, future “shelters”. More such houses would be needed for the growing population on limited area. Buildings for the individuals could give the space back to the community (as public and green area). The site is the one of the few where the iconic sign is visible in the area of the individual houses. We create the best residential space accommodated with the priority of the public photo spot and define the residential space for the future. Visitors to Mulholland has been a constant issue for local residents. There needs to be a mutual beneficial relationship between local residents and visitors at this intersection of the HOLLYWOOD sign “viewing deck”. Integrating floor tile units that converts the weight of cars and kinetic energy generated by visitor’s footsteps to the surrounding areas of BILLBOARD HOUSE. The aggregation of billboards generates water from filtering moisture in the air and rain water. The project creates a dynamic living system that interacts with the site like a “treasure flower” that blooms in the morning and closes her petals at night, by sliding the façade solar cell windows creating fabulous moving terraces. Floating inside a reticular earthquake-resistant structure that allows to conduct cabling and the rain water collection, it’s divided by 3 main floors: 1-Studio, 2- Living area and 3-night area, all with 360°views generates the ideal work-play-relax place for the modern ambitious family that enjoys their lives and preserves the planet. Communication as a necessity for modern living. 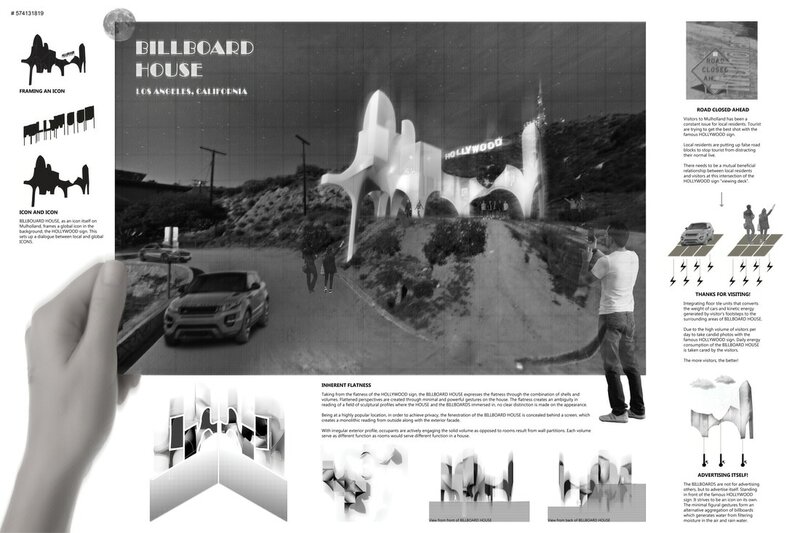 Multifunctional facade is a sun and privacy screen, a multimedia display, a mean of communication, Twitter account, an AI partner to converse with passers-by, visitors, and the owner. Additionally, the house has it’s own garden cultivated with water from moisture collectors. It runs across whole house, as an integral element of dwelling. 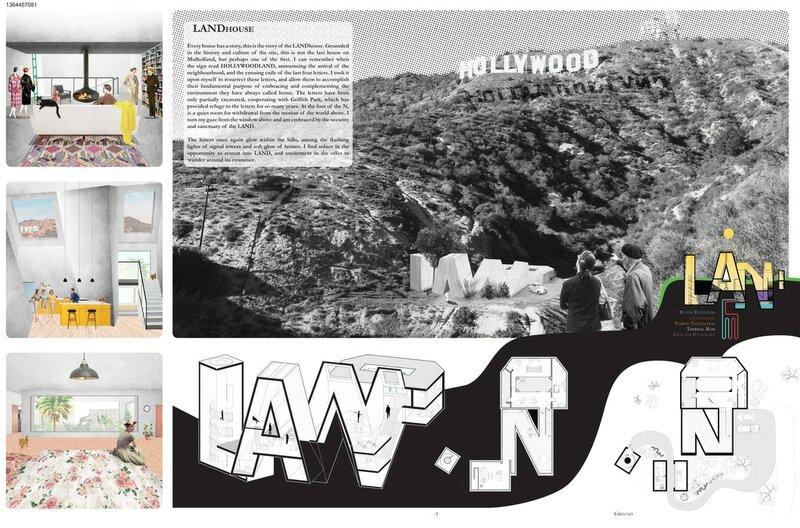 The Last of the First Residence proposes a montage of program to create a home that reconfigures to the immediate needs of the resident while providing a space that is adaptable and customizable. Our proposal integrates an interior kinetic volume—a rotating platform, that contains the circulation and specialized functions (kitchen, study, bedroom, washroom) of the unit. The dynamic rotation creates the possibility for unconventional programmatic combinations to align with the ideal living conditions (view, access to sunlight, ventilation, and openness). Our design liberates its user from the constraints of static architecture, eliminating sequential circulation, fixed program, and a definite perception of space. The dwelling is designed to not only comfortably accommodate a family but also be capable of adapting to potential other satellite programs. Considering the frequent tourist visitations, the residence and its multipurpose/rec-space portion of the house could be potentially rented/adapted for special events. Anything ranging from small exhibits or private events could be accommodated. 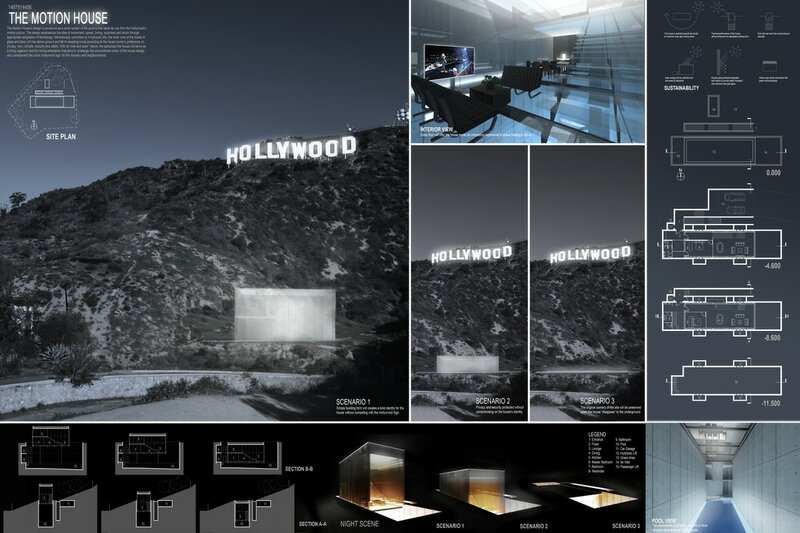 The dwelling appearance is based on a chimera like nature of Hollywood, distinct elements assembled to make a whole. The idea is to Hopefully leave the visitor with a profound experience of a place that teeter totters on the fulcrum of dreams and reality.